Camila teaches comprehensive sexual education in schools and works as an activist for La Cámpora Diversia, a political organisation affiliated with the progressive party Unidad Ciudadana. 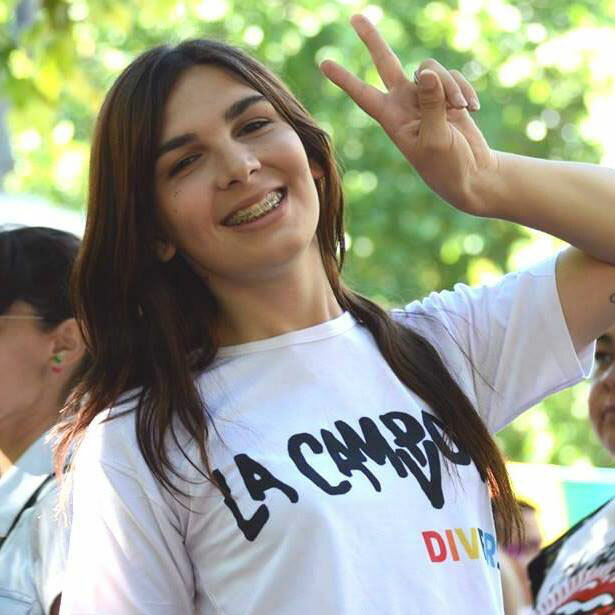 As a self-identifying transgender woman, Camila is heavily involved in fighting for changes to facilitate legal comprehensive sexual education in Argentina and strongly advocates for transgender rights and abortion rights. She has an impressive 10 years of experience as a political activist fighting for these causes. Camila is particularly interested in sexual and reproductive health rights as well as transgender and abortion rights. "Meterse en política es la mejor manera de cambiar las reglas en tu ciudad, en tu provincia y en sus países. Es genial ver cómo las ‘reglas del juego’ están cambiando. Pero cambiar éstas reglas no es la meta final, sino defender y proteger los derechos que lograste, porque nadie gana derechos, los derechos se conquistan. Le debo la mayor responsabilidad a mi país, como una de las 25x25 me gustaría poder ser lo más representativa posible, tomando en cuenta todas las necesidades de las mujeres y el Colectivo LGBTIQ+." "Getting involved politically is the best way to change the rules in your city, in your province and in your countries. It's awesome when you can see the 'game rules' are changing. But to change the rules is not the final goal, you must defend and protect the rights you’ve achieved, because we don’t earn the rights, we conquer them. As one of the 25x25 I have a major responsibility to my country, to be as representative as possible, taking into account all of the women and LGBTIQ+ community needs."